When it comes to practicality and people carrying capacity, one needs an MPV to get the job done. Renault has been working on one such MPV, known by its codename RBC until now. The French company has now given this MPV a name, it shall be called the Triber. Renault’s calling it India’s first super spacious, ultra modular MPV which implies that the seats could be removed or repositioned to suit the needs of the customer. Expected to be launched by the month of July, this MPV could do what the Kwid did for brand Renault. 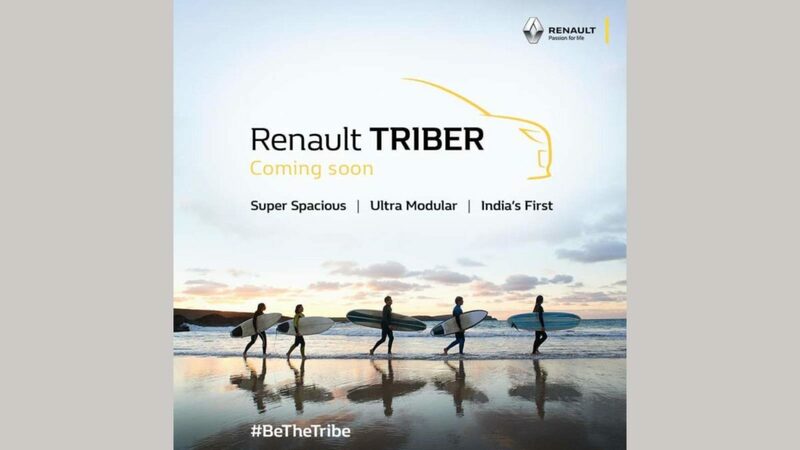 #RenaultTRIBER #SuperSpacious #UltraModular #IndiasFirst #BeTheTribe Link in bio. The Triber uses a new platform, which is built to be suitable for this particular application. It will try to be as spacious as possible, helping it accommodate more people in comfort without getting larger from the outside. The teaser showcased on Instagram reveals a bit of the side profile of the car, where one can see the upright bonnet and a rather large bumper. The spy shots seen until now also reveal the presence of LED daytime running lights, which do enhance its appeal. The Triber is expected to use the same 1-litre, 3-pot motor as the Kwid hatchback but rumours suggest that it will use a different tune to generate more power and torque. This engine will be paired with a 5-speed manual as standard and the 5-speed AMT gearbox could also be on offer. Apart from that, expect Renault to provide airbags, ABS with EBD, rear parking sensors, seatbelt reminders and a high-speed alert as standard across all variants. Expected to be priced in the INR 5 lakh to INR 8 Lakh bracket, the Renault Triber will place itself right between the Datsun Go+ and the Maruti Ertiga when launched by the month of July this year. Stay tuned to know more about this French MPV.